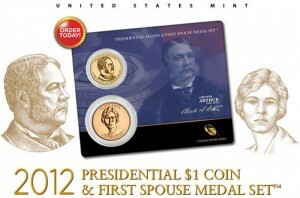 For the first time this year, the United States Mint has released a 2012 Presidential $1 Coin & First Spouse Medal Set. It honors Chester Arthur and Alice Paul. Sales began Thursday, October 18, at noon Eastern Time. Debuting sales figures are in for the newly released Benjamin Harrison Presidential Dollar Coin Cover, the twenty-third issue in the American Presidency $1 Coin Cover Series. 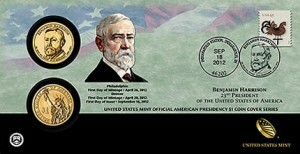 Starting today, September 18, 2012, collectors can order the Benjamin Harrison Presidential $1 Coin Cover from the United States Mint for $19.95. 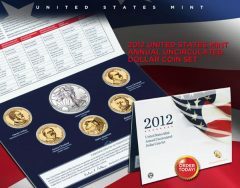 Released today, September 6, was the 2012 Annual Uncirculated Dollar Coin Set from the United States Mint. Debut U.S. Mint sales figures are available for newly released Benjamin Harrison Presidential $1 coins in circulating quality. 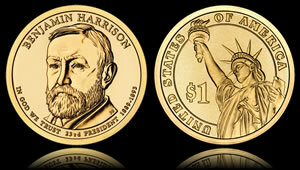 Honoring the 23rd President of the United States of America, the Benjamin Harrison Presidential $1 Coin was released Thursday, August 16, 2012. The United States Mint is offering the dollars within rolls, bags and boxes. On Tuesday, June 26, the United States Mint released its 2012 Presidential $1 Four-Coin Sets. Buyers have the choice of two, filled with either circulating quality dollars produced in Philadelphia or from Denver, priced at $9.95 each. Today, June 19, 2012, the United States Mint released a new Presidential $1 Coin Cover featuring two dollars honoring Grover Cleveland with an image of his likeness while serving his first term as President of the United States. Cleveland was the only U.S. President to serve two nonconsecutive terms. Rolls, bags and boxes filled with $1 coins honoring Grover Cleveland’s first term as President proved popular with collectors. 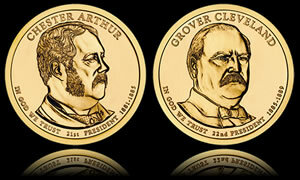 Heading into the three-day Memorial Day weekend, the United States Mint today, May 25, 2012, released the Grover Cleveland Presidential $1 Coin honoring the first of the former leader’s two non-consecutive terms. The new coins celebrating the 22nd President went on sale at noon ET directly from the U.S. Mint in rolls, bags, and boxes.